Portion control and product quality requirements make this economic scale perfect for use in pizza parlors, sandwich and salad shops, bakeries and supermarkets. Great for use in food operations to build consistent products and help control ingredient costs. 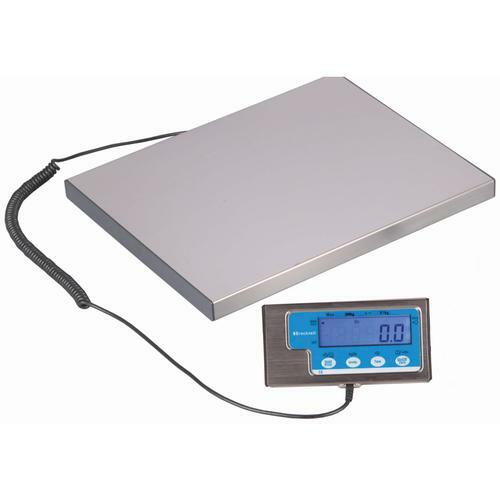 Optional remote switch allows zeroing of the scale without using your hands. The dual power modes (battery and AC adapter) enable portability or permanent installation (both included). A large, simple to read display can be wall or stand mounted for easy visibility and the push button switches work with gloved hands (wall and desk mount included). The indicator cable is a coil style for durability and easy extension to the wall or desk mount display. The LPS-15 features a full-duplex RS-232 interface that can transmit and receive using a demand type protocol. The durable low profile SST platform allows for easy weighing and cleanup. Although NOT suitable for washdown, this scale is perfect for an environment where wipe down sanitation is sufficient. The LPS-15 is a low cost, versatile and portable scale. Construction– Low profile stainless steel platform with mild steel understructure, stainless steel/ABS indicator with wall bracket and desk mount included.